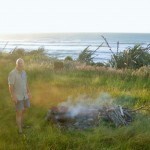 Near the end of a long, dusty metal road we found an idyllic camp-site at Anatori, overlooking a wild beach. We had a small clearing all to ourselves which was a bit of a surprise, but when we walked down to the river for a swim we saw a bunch of other vehicles parked further from the road. There was nobody about near the water, so we swam naked in a deep pool then sat on a smooth limestone rock in the late afternoon sun to dry off. We timed it perfectly because another couple and their dog walked down from the camp just as we were getting dressed. Felicity had bought a whole salmon for dinner, so we collected some driftwood and I made a small (and probably illegal) fire to cook it on, wrapped in aluminium foil. We watched a beautiful sunset over the sea, then a nearly full moon rising over the hills behind us. 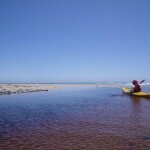 In the morning we headed back a few kilometres to the bridge over Sandhill Creek, where we had seen we could park safely off the road and launch our kayaks. We negotiated a few big logs with some difficulty, then came to a low rapid that would have forced us to get out and drag the boats. Fortunately I had noticed a tiny side stream entering from the left and I figured it must be the way we were looking for so we paddled back and headed up it. It took us almost an hour winding up a narrow channel, with beautiful red flax flowers, ferns and kei-kei vines lining the bank. Sometimes we could paddle over the flax flower stalks, but sometimes we had to lift them over our heads to get past. In front of me, Felicity disturbed a duck which tried to fly away in panic just as I was passing. I thought it was going to crash into my head but it gained enough height just in time. 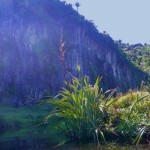 We entered a narrow valley cut through high limestone cliffs. We could see stalactites hanging down from ledges, and lots of interesting rock formations. 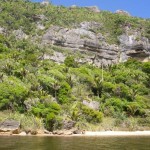 On this part of the coast the predominant tree is the nikau palm, so the environment almost felt pre-historic. Eventually we arrived at Lake Otuhie, and spent the next hour paddling around the edge. One large limestone rock at water level had some holes in it that made several musical notes as the lake surface rose and fell. 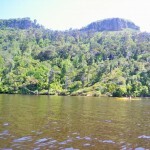 Almost all of the lake was surrounded by native bush, with huge rimu and totara towering over the nikau. At the head of the lake we disturbed huge flocks of swans and ducks. Some of the baby cygnets were too young to fly, and had to make do with paddling frantically to get to safety. Apparently black swans went extinct after Maori arrived in NZ, but have successfully re-established themselves from Australia. A small beach with a rocky overhang made a great place for a swim and a picnic, although the sand turned out to be a bit wet due to a tiny trickle of fresh water spilling from the roof. There was enough dry rock for us to sit, and whn I examined it closely I could see seams of flaky black that I’m pretty sure was coal. On the way back, we kept paddling past the bridge and down to the beach, where we could see the waves crashing on to the sand. 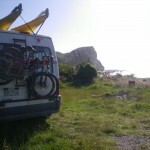 Neither of us fancied continuing out into the Tasman so we returned to the van and packed away all our gear. 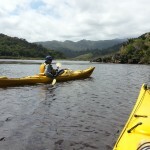 We are now just south of the Wairoa river, parked in the bush off the road on the edge of the estuary. We found a tiny track down to the shore where I discovered the slipperiest mud I have ever encountered by falling on my bum the moment I stepped on it. I had intended to swim naked again, but the need to wash the mud off my clothes changed my mind. I probably would have gone to the bother of preparing a wild duck if it had fallen in to my clutches, but we had whitebait on the menu so I wasn’t disappointed. the rock walls and cliffs in the background yeah I reckon I’m dead lucky having you fellas as my guide . Can you drive to the lake for kayak access? I fancy exploring it myself but prefer paddling upstream out of lakes. I’ll be staying in Pakawau soon so keen to check it out if not too far and accessible. From what I remember, the land surrounding the lake is all private, and there is no direct public access. But the trip up the river is fantastic and part of what makes this such a great trip. 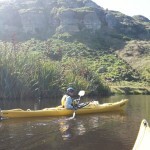 If you have the opportunity, don’t miss this – I’d rate it in the top 10% of paddles we have done. Thanks John. Would I need to time going up from Sandhills Creek with the tide to ensure getting up? Was it paddle all of the way from the road or will I need kayak wheels? 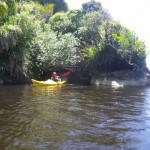 I’ve never been to the Collingwood area before so very keen to check out the Whanganui inlet creeks as well. Been to Abel Tasman but never that far north. No it’s not tidal as far as I remember, and yes you can launch next to the road without needing wheels. 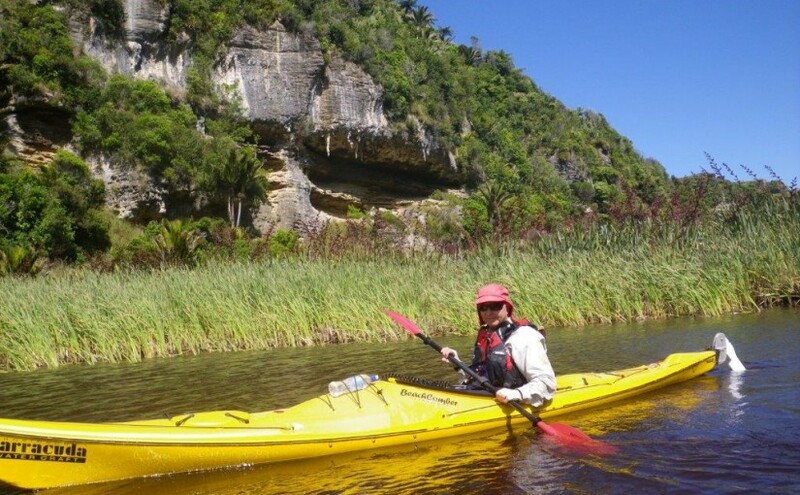 I’m assuming you have a normal size single kayak – the creek is quite small and windy and our 6 metre double Sea Bear Packhorse would never make it. The water level may fluctuate if it hasn’t rained for ages, but hey, it’s the West Coast so probably no worries. 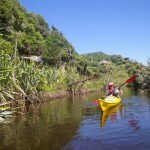 The Whanganui inlet creeks definitely need to be timed around the tide – there is a LOT of mud when the water level drops. Yeah good old Perception Scimitar sea kayak, single kayak. If you go down Te Anau at all, be sure to check the Eglington River out heading downstream from Camp Creek. It’s small rapids in a lot of places. Took my little Sprite down and that was absolutely fantastic. Muddy eh? I was hoping it would be similar to Okarito 🙂 I’ll be sure to plan with the tides for the inlet. It was awesome to find your blog by the way. Perhaps you’ll be able to offer future paddling insights too. Thanks for the advice about the Eglington River – we haven’t managed to get that far down south yet, but it is definitely on our bucket list. 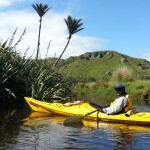 All our kayak trips can be found archived here: johnp.co.nz/tag/kayak/. We are in the UK at the moment, so our next trip will be on the Norfolk Broads. Hi John. I think I arrived 2 hours too early before full tide. Banks were about 3 feet high and it was muddy. 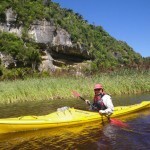 I managed to stand on a log and get into my kayak.. Paddled perhaps 50m up the creek and came to some rapids. I got out, walked up the creak to where it forked but there wasn’t enough water to float the kayak. Real bummed out I was defeated on this one. It was 3 degrees and being on my own I gave up. I left the kayak by the creek and walked back down the private farm road to the car to get my kayak wheels. I honestly don’t think I’d have been able to climb out where I put in. Decided to stick with Collingwood creeks and Aorere river for the remainder of my trip. I’m sorry to hear you didn’t make it. I would have expected there to be more water in the creek at this time of year than in summer. I still don’t think the tide is a factor, but I could be wrong. But now I read your experience, I’m pretty sure I remember us running aground on a sand bank on what looked like the main creek, then going back and finding a tiny entrance in the flax that looked not much bigger than a drain. We quite often get out and tow in situations like this (easier on a hot summer’s day!) Our kayaks are composite/plastic so we don’t worry about dragging them over rough stuff. Have you looked closely at the satellite image on Google Maps?